My interest in geosciences began as a student at Central Kings. In my senior year at Central Kings I was fortunate enough to join a class trip to Iceland, the highlight of which was a hike to the top of the Eldfell volcano on Heimaey Island, located just south of the Icelandic mainland. I also was wise enough to drop Biology and take Geology instead during my senior year. These experiences and a desire to work in and explore the natural world kindled an interest in Earth sciences that led me to take geology at Acadia. Studying geology at Acadia was fantastic and led me to study some 400-million-year-old volcanic and sedimentary rocks in New Brunswick. What fascinated me the most about this research, and continues to fascinate me, is the way that studying rocks can vividly reveal events in Earth’s past. This fascination led me to a master’s project at Memorial University, where I studied the Mesozoic sedimentation history of basins in the deep offshore Newfoundland. 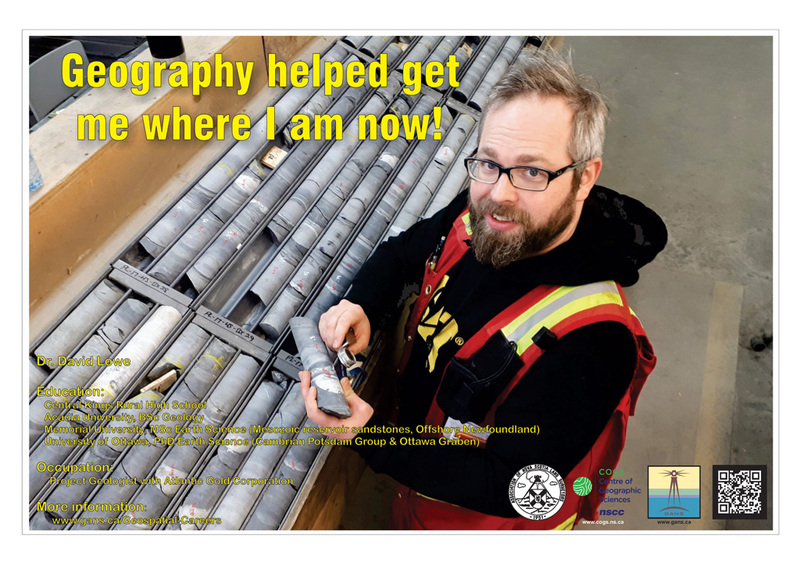 However, at the same time I took the opportunity to routinely step away from my studies, undertaking bedrock mapping in remote parts of Ontario and Labrador, and working summers as a geology intern in the oil and gas sector in St. John’s and Calgary. As I was wrapping up my MSc, I was working as a laboratory technician at Memorial University where I became involved in many analytical mineralogy and geochemistry projects. At the same time, a confluence of factors shaped my decision to pursue a PhD. The first was my innate curiosity and desire to contribute to geoscience in general. The second was the financial crisis of 2008 – 2009, which effectively removed the option of a prospective post-MSc posting as an industry geologist. Starting in 2010, I decided to pursue a PhD with Bill Arnott at the University of Ottawa, one of the foremost sedimentologists in Canada, and chose a project that involved bedrock mapping and outcrop studies across a large area of eastern Ontario, western Quebec. This project included many months of field work and exposed me to new ideas and new places that I’ll never forget. I also came to call myself a “sedimentologists” – meaning that I specialize in sedimentary processes and the study of sedimentary rocks, and now have numerous scientific papers under my belt. Late in my PhD I worked a summer with Shell in Calgary and was offered a full-time position starting in 2016. However, once again factors in the global economy would shape my fate, and after the 2014-2016 oil glut and drastically falling crude oil prices my position with Shell was reorganized out of existence before I could even start. Nevertheless, I successfully defended my PhD dissertation late in 2016, and after some time on the job hunt, finally landed on my feet early in 2017. It was then that I began my current position as Project Geologist with the exploration department at Atlantic Gold, based here in Nova Scotia. I currently explore for gold in the province and generate geological models and cross-sections that highlight the subsurface architecture and composition of our gold discoveries. My long-term goals are to move into a role that involves more research and regional bedrock mapping, and to apply my industry experience to undertaking research that helps us understand and reduce uncertainty surrounding our search for natural resources.